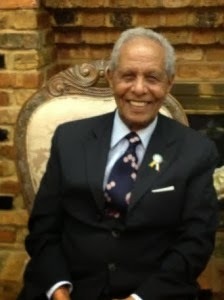 In January 2014, Anthro21 sponsored a private screening in Washington, DC of the documentary film “Ethiopian Tenacity: The Untold Stories of the Axum Obelisk.” produced by Tadele Butul Kibrat (shown in photo at left) an engineer from Ethiopia who worked in returning the Axum obelisk from Rome, Italy to Axum, Ethiopia. In a speech on January 11th Mr. Kibrat shared “There is no video showing how the ancients erected the Axum obelisk. Now there is a film that shows how the obelisk left Ethiopia, went to Italy and came back again.” The film is scheduled to be shown in countries around the world. Mr. Kibrat graduated from the Chicago Technical College with a B.SC. in Civil and Structural Engineering in 1960 from the United States. He was immediately employed by John Mattson Building Construction Company as resident engineer for the construction of a 25 story building, Wennegren Research Center in Stockholm. He has also worked for Hus Consulting Firm where together with his colleagues has designed the steel structures of the State Bank of Persia (Iran) and the Grand Hotel in Poland. In 1966, he established his own real estate company and other business ventures in Stockholm, which he operated until his return to his homeland in 1986. Engineer Tadele is also an author and philanthropist. 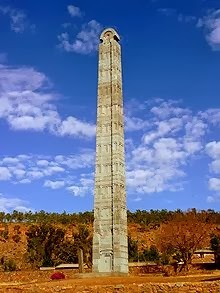 The obelisk, also called a stele, was found fallen on its side by the Fascist Italian forces in 1936 as they entered the city of Axum, Ethiopia. The obelisk is 1,700 years old, nearly 80-feet high and weighs 160 tons. The obelisk was originally erected during the 4th century AD. The monument is also decorated with a false door at its base and what seems like windows above. It is believed to have been erected in memorial to royalty. And it is topped with a dome shaped head, unlike the popular pyramid topped obelisks. The monument was taken by Italy as trophy in their desire to claim Ethiopia as their own. It was moved from Axum and re-assembled in in Porto Campena in Rome in 1937. The Ethiopians fought back again the invasion and were also joined by allies and victory was declared in 1941. Then in 1947 in the aftermath of WW II, Italy officially agreed in a United Nations agreement to return the stele. The film then progresses telling the personal experiences of Mr. Kibrat and his work with local, national, and international organizations to have the monument returned to Axum. The final return was world news in 2005 and again in 2008 when it was officially re-erected. Repatriation of historical artifacts are a very sensitive issue; and growing worldwide. Many countries around the world are on record regarding these issues. This film is important because it documents the return of a major ancient masterpiece to an African nation taken during wartime in the 20th century.